You All heard about the Magic Mirage Island, where you can find a great variety of amazing and innovative products. Though the island itself is unreal, items from it are quite real. You'll see new functional button. Press the button and you'll have a chance once a day to receive a set of Magic Lamps - Greedy, Speedy, Madly Maxed. You can place these lamps in your own house, scarecrow or any other property. As lamp is alive it needs to eat. If you don't feed it within 5 days, it will simply disappear. If you decide to remove lamp, it will simply disappear. So, how to feed a lamp? Daily: Merciless Victor - 5 times to win on Free-For-All Arena. Reward: Honor Points, Additional Entries, Warrior's Medals. Repeatable: Lamps Tributes - You need to choose a lamp and Daru will provide you with task for it. Complete a quest and you'll receive a required Tribute. Bring your Tribute to it and it will reply you with reward. As soon as you bring 10 Tributes to the lamp - it will reward you with Celestial Armor (Vambraces) or Divine Cloaked Dungeon Weapon (at your choice). Neat! One question: do the lamps become permanent after they're fully fed? As soon as it's fully fed, lamp gives you a Crystal for Armor or Weapon and disappears. The second quest the Daru gives you is the one where you receive the item to feed the lamp. The first quest is just for pvp rewards. Event lasts for 15 days - need to do 10 quests to complete one of the lamps, quest is repeatable once a day. So you can only get one of the items from this. Either the Celestial Warrior Armor or the Divine Dungeon Weapon. You can NOT get both, so make sure you choose wisely which one it is that you really want to get. Personally i prefer to get the Armor since that saves me like 300 warrior medals + a slew of other crap. Dungeon weapons are easy enough to get, if i could've gotten both i would've. BUT it's not 100% confirmed info until somebody from ArcheRage team say it's true. Do we really need to kill 80 Serp bosses for one pet and 50 Greater dungeon bosses for one Divine dungeon weapon? A staff member said on the official Discord that there is no pet and we only get the 1 hour buff. 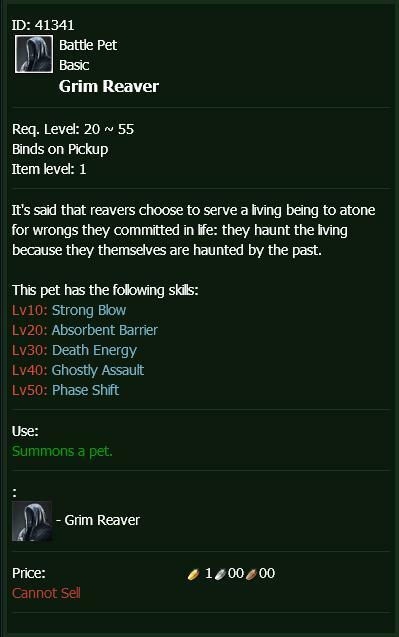 Why no Grim Reaver for us? Each lamp will provide you with specific buff for 1 Tribute. When you have 10 tributes provided to any lamp you'll receive Armor or Weapon. Chances are 50% for Armor and 50% for Weapon from any type of lamp. We'll have description fixed. Okay, so allow me to help clarify things a bit. We have a 50% chance to get either the Weapon or the Armor from 1 of the lamps. Since it's a 15 day event we can't even try to get the thing we want. So it's really not even an event at all but more of a RNG festival to make people not even want to try their odds at getting something they don't even need. I was okay with picking a lamp and going for what i wanted since we could only do it once anyways it made people choose what they wanted to go for. But now it's all rng why even bother with it? 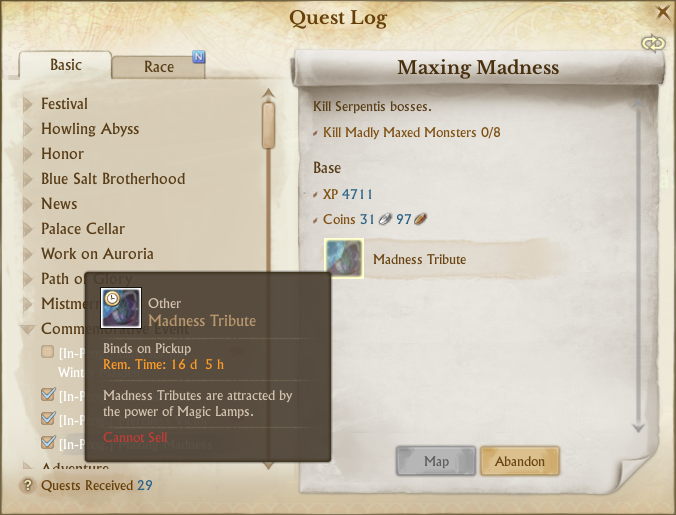 So the quest should be repeatable unlimited times in a day, and not just once a day? I figured it was a once a day thing, if it's suppose to be repeatable unlimited amounts through out the day then this is totally worth. The quest is meant to be infinitely repeatable. Although only 10 tributes per lamp per day. ahh, now that makes more sense. thanks for clarifying that for me. Why does my lamp says "time left: 6h" ? I fed it twice. The other two that were not fed say: 4 days Xh Xmin left.